Now that the Cannes Film Festival 2005 is over, I thought I'd share with you same small clips taken backstage. Sorry I didn't have time to post them on the official blog http://glowria.fr/live. Thanks for the caricature, I love it :) Just wished I end up like George Lucas! No need to go to the Cannes Film Festival to meet beautiful blondes, dressed up in leopard dresses! Update: my pix of the evening are here (on Flickr). Hurray! 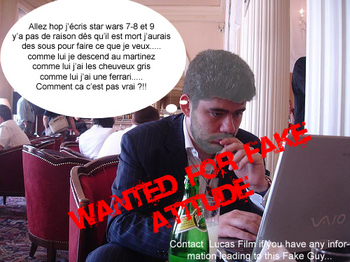 back from Cannes! IT was great fun, lots of work too. If you're wondering what I'm talking about, then have a look at our special blog for the event: glowria.fr/live. 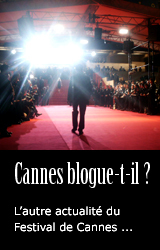 Fellow bloggers, please give me a hand in making this FIRST EVER BLOG COVERAGE OF THE CANNES FILM FESTIVAL a huge success. The feedback on the Croisette here is phenomenal, the press is starting to pick it up; now we need you to start relaying the operation on your respective blogs - if you agree to do so of course - and maybe carry some of the banners we've created for you all! The HTML code for your blog is here. Well it's all happening on the glowria.fr/live blog ! We're covering the Cannes Film Festival with a team of 10 people, blogging live anecdotes, backstage events, parties, breakfasts, film screenings, etc! We're even doing a street marketing event where we're handing 30,000 flyers to all on-lookers with the help of 3 absolutely lovely hostesses. What for ? Hey, we're allowing anyone to post a picture to photo@glowria.fr, or send an MMS or an SMS and be published immediately on our blog. I'll add a line of code in a minute to the blog to allow your pictures to appear ! That's neat. I look forward to your contribuion ! Folks, I'll be off this blog for the next 3 days, and be blogging live from Cannes on our fantastic "Blog me I'm famous" blog, covering the festival. It's a geek's paradise, connecting alternately with WiFi, a 3G data card, and GPRS phones. Let us know how you like it ! We're a team of 10 people covering the event, both in front of the cameras and backstage.